I found this prayer with chords on youtube and decided to write down the chords and lyrics so that it would be easier to sing with, since I couldn't find it anywhere else online. I find this prayer very profound and beautiful. In my experience, it's not so much the religion that matters as it is the people believing and how they believe. I was very touched by this song. I joined RouteNote 16th June 2012 and have had a good experience with them so far. There have been technical glitches every now and then (such as tracks not uploading properly) but after contacting their customer support I always got a timely reply with a satisfactory solution to my situation. Read more about how I found RouteNote. My music is available on Spotify and a number of other music services online. I have uploaded my tracks for free, and in exchange RouteNote takes 15% of my earnings. At any time I could upgrade any song I like to get 100% of the earnings, but that would cost me $10 per single (there are better deals for whole albums). I've earned $1 for every 317 Spotify streams on average. Having only 14 tracks uploaded and not marketing myself that much, my total earnings for my own music after almost 2 years amount to only $6.46. However, RouteNote recently implemented a referral system where if I get someone else to sign up for RouteNote, they still get 85% for their free tracks, RouteNote gets only 13% and I get 2% for referring them. Looking at my referral report, I could calculate how much other people, who are more serious about marketing their music, are earning. Simply take my 2% and turn it into their 85%. Here are the top ten earning months from my 681 referrals. They are all anonymous. So, as you can see, there are a some people out there who became fairly successful! This does not include their tracks that they paid to upgrade to receive 100% of the earnings, since my referral fee is only for the free tracks. Sign up for a RouteNote account here! There have been many different tuning methods throughout time and none of them are perfect for all music. This is because music is based on intervals between notes, and those intervals do not always add up when yous switch key. According to Ptolemy's intense diatonic scale, which is considered the only tuning that could be reasonably sung, and corresponding with modern just intonation. Gandharva Veda uses this system of tuning which means that the resonance between all the different notes will be preserved. The C major scale looks like this if we use 528 Hz as the starting note. All of these frequencies interact harmoniously with each other and all intervals are perfect equations with small . It also works with A minor, since that scale uses the same notes. However, if someone played a C major song and switched to D major, A would be the fifth and should equal 594 Hz x 3 / 2 = 891 Hz, which is quite different from the A = 880 Hz in C major. Your ear can hear difference a difference of 1 Hz between two notes that are sustained, so 11 Hz is a large difference. Pythagorean tuning is not even harmonious within a single key and uses only perfect fifths (3:2) and octaves (2:1) which creates very large integers, such as 243:128 for a major seventh which comes from five fifths up and two octaves down (3/2)5 x (1/2)2. The big downside is that thirds (which form the middle note in chords) are dissonant - they are 81:64 instead of 5:4, which means for the above example E = 668.25 Hz instead of 660 Hz. Those extra 8.25 Hz means that musicians working with Pythagorean tuning can't play regular chords, but have to stick to simpler music using mainly fifths instead. With Equal Temperament musicians figured out a way to play all different keys on the same instrument with a harmonic sound. Even though Equal Temperament is often viewed as a Western invention, it has been historically discovered by a Chinese man in 1584 and a Dutch man in 1585, independent of each other. Instead of working with intervals that relate to each other in mathematical harmony, equal temperament simply divides the octave into 12 equal pieces. The downside of Equal Temperament is that some tones are more than 4 Hz higher or lower than their Just counterparts, which is a clear audible difference. This means that a perfect fifth, which is 3:2 in Just Intonation, will instead be 2.996614:2 in Equal Temperament. In Just Intonation the fifth and the unison would resonate with each other every 2 beats for the fifth and 3 beats for the unison. However, in Equal Temperament the fifth will slowly go out of beat with the unison since there is no exact mathematical relationship. This means that instead tones strengthening each other, they destructively interfere with each other, as can be seen in the following image from a lecture held at Maharishi Vedic University, Vlodrop, Holland, in January 2011. "The two upper waves are the sounds, while the wave under is the combined sound that we hear. The two sounds have the same amplitude. The changing amplitude of the lower wave shows the change in volume of the combined sound. At point A the two sounds are somewhat synchronous, and the combined amplitude is at its largest. Then they become less synchronous and the combined amplitude becomes less. At B they vibrate opposite each other and the combined amplitude becomes zero, making no sound. Then they gradually move back to synchrony, while the combined amplitude gradually increases and reaches its maximum when the two waves again become synchronous, and so on." So, even if you have tuned your guitar to A = 432 Hz, the guitar itself does not use Just Intonation and so even if A is the right frequency, no other tones will be. The easiest way is to play a fretless instrument, such as the violin, since you can adjust each note as you please. However, with guitar and keyboard there are no easy solutions to this, unless you want to build your own guitar like this guy did! This post is inspired by David Hurlin's post Vantage Point where he talks about how drumming on unconventional instruments such as mailboxes can unlock innocent creativity. I would recommend you to read the full post! This brought to life an idea I've had for a while. In my mind, the guitar is a more creative instrument than the piano. Now, don't get me wrong, pianos are beautiful and great music has been written through playing the piano. However, a piano is linear, whereas a guitar is two dimensional. Each string on a guitar is like a mini piano. In addition to this, a guitar presents all tones as equal since it does not distinguish between black and white keys, whereas a piano tells you which tones you should play for C major and all other keys are played in relation to C major, as far as the black and white piano keys are concerned. Sure, the piano has potential for grandiose pieces of music since you can use all ten fingers at the same time, whereas with the guitar you only have six strings and five fingers to play with. 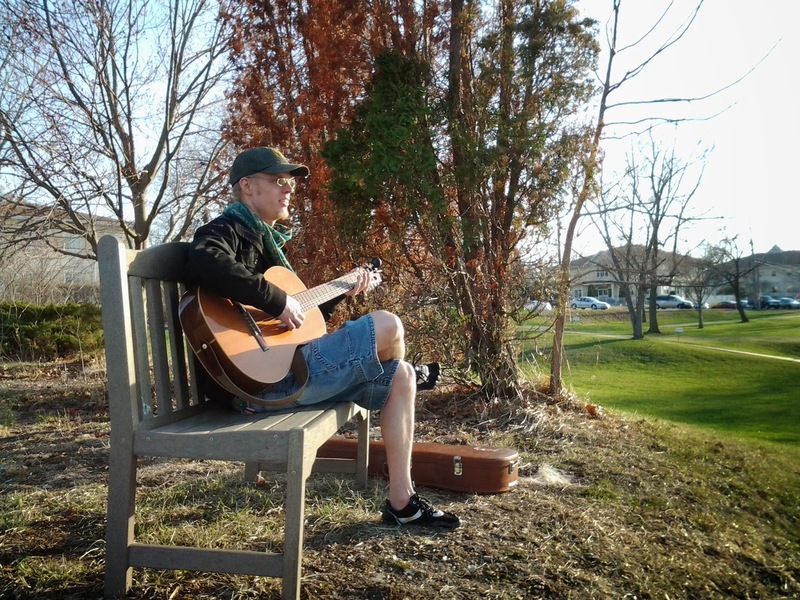 In my experience though, the guitar has inspired me to create more original music without referring to music theory. When I first started writing "The Sound of Rain" I simply took an open C major chord and moved it down on the fret board three steps. This jumbled all the notes somewhat and when I played the different strings there was a new sound that I really liked and started to play around with. I also like that my guitar doesn't have marks for the 5th, 7th 9th and 12th fret, because leaving room to make mistakes also means you can find combinations you never would have thought of. As one of my teachers always say, "There are no mistakes, only happy accidents". When I play music with others, there is an interesting meeting taking place. I started playing music to express myself and to get to know myself better. Playing with others allows me to know myself in terms of how I'm different and unique compared to others. I discover that as a musician, I'm stable and steady. I know a large repertoire of songs. I also grow in unexpected ways from being influenced by the people I play with. I become more fluid and free. I start to improvise songs never written before. I recently recorded one of my songs, The Sound of Rain, with my friend Kurtis Kujawski freely improvising to the song. To me, it really shows how the interaction between structure and flow can create a wholeness more beautiful than each part. When I play with other people I play less for my own sake and more for the sake of the music itself. Being part of something greater makes me realize what my true talents are and inspires me to develop new ones too. A few days ago I did an experiment with my friend Nick Tucco, similar to the previous post where the frequency of 432 Hz created symmetric patterns. This time we are using 528 Hz, which is one of the Solfeggio Frequencies. We used my guitar amp, his drum, and a bunch of sand. Connecting my amp to a computer, we played the tone 528 Hz on pretty high volume which made the drum vibrate and distribute the sand over its surface in patterns. Initially we had too little sand, which only showed a hole in the middle surrounded by two rings of sand. Later, when we added more sand to the drum, the hold in the middle didn't show up, but instead seven empty circles around the edge of the drum were seen. Both times we used 528 Hz. The sounds we create have an impact on the environment and can create something beautiful. Taking this to a deeper level, our thoughts are nothing but unmanifest sounds and have similar capabilities. Before we can speak, we have to have a thought, even if it is unconscious. If we can fine tune our amplifiers to create sand patterns on a drum, who says we can't fine tune our consciousness to create patterns in our life? If you want to delve deeper into the mystery of frequencies, read about the difference between 440 Hz and 432 Hz here. I've been reading about alternate tuning and done some of my own research into the subject. The standard tuning for instruments is A = 440 Hz This was decided in 1939 and this is the only official standard tuning around the world. My preferred tuning is A = 432 Hz which according to some studies is a more harmonious frequency, in tune with natural law. 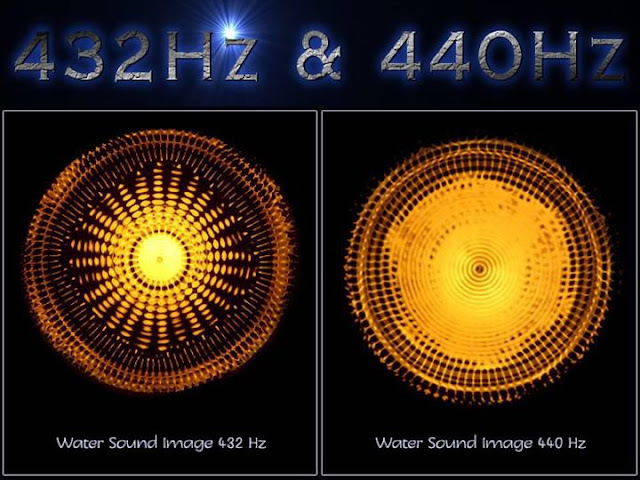 You can see for yourself with these two water sound images of the two frequencies. Worth to mention is that there are many alternative frequencies for tuning. Some people say 444 Hz is the "sacred frequency" but so far there is no "right" or "wrong" tuning defined. There are claims that 432 Hz was the standard tuning for classical composers, but this is not true. There was no such thing as a standard tuning before electromagnetism was discovered in the 19th century, which enabled the precise measurement of frequencies. Old organ pipes are tuned to a large variety of frequencies. "For example, an English pitchpipe from 1720 plays the A above middle C at 380 Hz, while the organs played by Johann Sebastian Bach in Hamburg, Leipzig and Weimar were pitched at A = 480 Hz, a difference of around four semitones. In other words, the A produced by the 1720 pitchpipe would have been at the same frequency as the F on one of Bach's organs." You can also see a practical experiment I did with some friends on the Solfeggio frequency 528 Hz in this article. For a more philosophical article, read about the Source of Music. 2012/09/26 - Recording with Big Brother! 2012/08/12 - Find me on Spotify, iTunes, Amazon & RouteNote! 2012/08/05 - What is the essence of music? All work is original, so only personal, non-commercial use of my material is allowed.